When talking about hardwood floor types, we tend to think of that basic 2 1/4” wide flooring that we have seen in our homes growing up. But to be honest there are so many species, classes, grades, and manufacturing processes that it just isn’t the case anymore. Most of the hardwood used in flooring today is made from common American hardwoods. Solid Hardwood Flooring – Traditional hardwood flooring is comprised of a singular piece of wood with tongue and groove sides. Most com unfinished, but they are also pre-finished when buying retail. 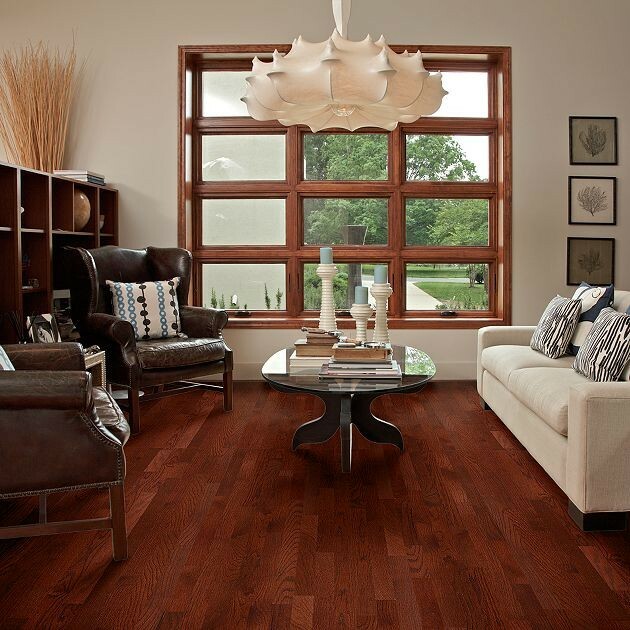 In this type of hardwood flooring, it is usually very sensitive to moisture. Solid planks of wood are usually nailed down over a wood type sub-foor and not recommended for use over a concrete slab or below ground level. The great thing about solid hardwood is the fact that they can be refinished and restored as many times as you want throughout their life. And a solid lifespan is usually decades! In fact most people in there many travels have probably walked on a hardwood floor that is a century old without even knowing it. This is the power of choosing solid hardwood over the others. One flaw that I see all too often is when a solid hardwood floor is installed in a home that is located in an area of the country (such as Florida,) that has high humidity summers. Too much moisture can cause your floors to buckle and cup, which is never a good thing. Engineered Hardwood Flooring – For some reason these floors are feared by the masses because of the word “engineered.” When most people see this they think laminate, however there is not a drop of laminated or plastic material in the construction of this incredibly beneficial 100% hardwood flooring. Engineered wood floors are constructed of 3 or more thin sheets (called plies) of wood that are laminated together to form a single plank. The plies are usually laid in opposite directions (called cross-ply construction) to each other during the manufacturing process. This type of construction creates a hardwood floor that is dimensionally stable and not affected by changes in moisture and temperature variations like traditional 3/4" solid wood floors. The advantage of cross-ply construction is that the wood plies counteract each other, thus prohibiting the plank from expanding or shrinking. Engineered hardwood floors can be installed practically anywhere, including over wood sub-floors, concrete slabs and in your basement. They can be nailed down, stapled down, glued down — even floated over some types of existing flooring. Engineered hardwood floors are comprised of several layers of wood, the finish of the top layer can be a completely different wood species than the lower layers. Well now you know the hardwood floor types. It is pretty basic understanding the differences but it is always good to have a lesson.